Also on my mind was this: Sterling and Castile were devastating murders caught on tape, but the world that produces those murders was not radically different this week from last, or last month or year or one hundred years ago. These are events, but the violence is ongoing, everyday. I headed west on my bike to remind myself of that everyday violence, etched in the decaying neighborhoods of one of the most segregated cities in the world. I first rode south and west, trailing a car on 27th Street that had one of those memorial clings on the back: mom and dad remembering their 23 year old kid, RIP. I told myself to remember his name, but a few miles later it was already gone. The privilege to forget a name–does it mean it doesn’t matter to us? I took a left, a right, a left again, heading west on Lafayette toward Pennsylvania and the corner where the memorial left in place of the Royal Theater reads: RIP FREDDIE GRAY. I crossed, took a left and a right again, on Lanvale and toward Harlem Park. So many empty lots overgrown and the dumping sites for old mattresses and trash, so many vacant homes, boarded up next to the homes of people making their lives here. I was less than a mile from Bolton Hill, but I was in a whole different world. There are so many different worlds being lived in the same place, and it’s so easy to pretend we can’t see each other. I snapped this picture of one of so many grand buildings in this neighborhood, blocked off with fences and covered over in ivy, nature taking it back in a way not at all natural. I took a right and stopped for a breath on the bridge over Route 40, that highway to nowhere whose promise justified the disinvestment during urban renewal that left the remains I saw on my ride. Generations of violence, these latests deaths the logical outcome of the white supremacy that builds some neighborhoods over others. 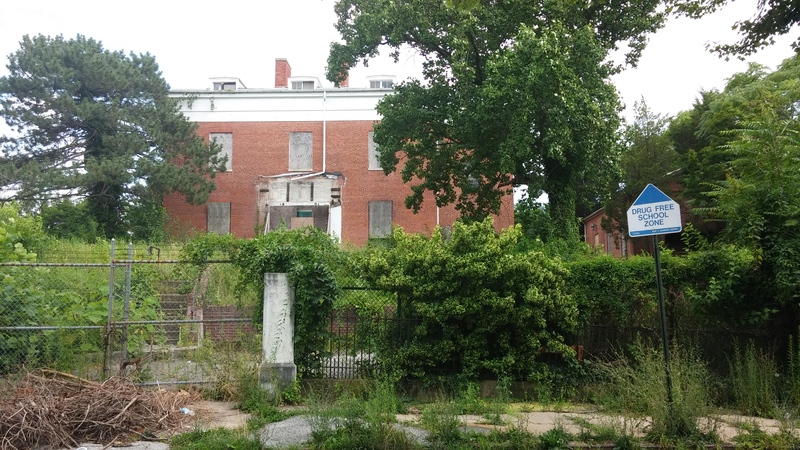 The wealth of Bolton Hill and Mount Vernon depends on the poverty of Upton and Harlem Park, but you’d never know it, the way we talk about things. I ended my ride with a walk through the traffic caused by the latest sinkhole and then a ride to the sinkhole in Mount Vernon where workers have been rebuilding the sewer for weeks, no end in sight. I shared a beer with N. and B. and then we walked down to a rally and march against police violence at McKeldin Square, because people are dying, and on this day, we had had enough, so here we were again, on repeat. This entry was posted in bikes, blight, neighborhoods, police, politics and tagged Alton Sterling, Baltimore, Bolton Hill, Harlem Park, marches, Philando Castile, police violence, rallies, Upton, West Baltimore. Bookmark the permalink.